Have you used the IR marked cards? Do you still believe that the IR marked cards are safe? 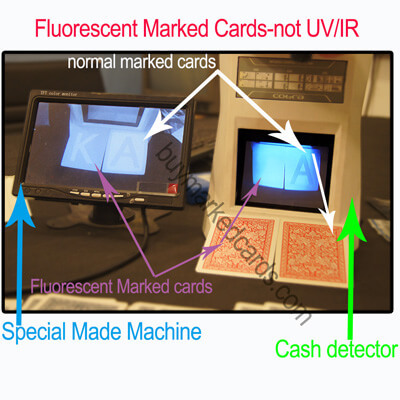 Lots of people say that IR marked cards are good, it can not be recognized by UV light. and it only can read by IR camera. Yes, IR cards is good. but now, more and more players know there is IR cards exist, and some players already know how to recognized the IR cards in simple way. Like US dollar cash Detector. in that case, the IR cards is not the most safety marked cards now. Thus, our company have been developed a new marked cards, That is fluorescent marked cards. The fluorescent marked cards is Marvelous. There is no technology or machine on the market can recognize the code on the cards, unless you have enough money to buy our scanning camera. 1. Can not be recognized by IR camera. 4. Can only be recognized by our special made camera. 5. Higher Practicality, Easy operation, easy camera installation.